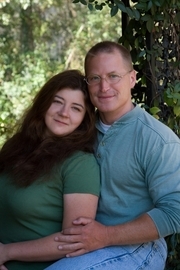 This is a husband and wife writing team, writing under the name Ilona Andrews (which is why gender is n/a, as directed on the common knowledge help page). Kim Harrison will sign and discuss The Witch with No Name (Harper Voayager; $26.99), the final book in the Hollows series. Kim Harrison, dark urban fantasy author of the New York Times best selling A Perfect Blood, was born and raised in the upper Midwest. After gaining her bachelors in the sciences, she moved to South Carolina, where she remained until recently returning to Michigan because she missed the snow. She's currently developing what comes after the Hollows between working on the Hollows books and a Hollows-based graphic novel. Kim is a member of The Science Fiction and Fantasy Writers of America. When not at her desk, she's most likely to be found landscaping her new/old Victorian home. Ilona Andrews will sign and discuss the first book in their new series, Burn for Me (Avon; $5.99). Gordon and Ilona currently reside in Texas with their two children and many dogs and cats. They have co-authored two NYT and USAT bestselling series, the urban fantasy of Kate Daniels and romantic urban fantasy of The Edge and working on the next volumes for both. Kim's doing something new this year. Individual store are joining with me in an effort to raise a few tomatoes! If you bring in a canned good, you'll get a hug from Kim. :-) All donations will go to a local food bank, and though she's suggesting canned tomatoes, tomato paste, or tomato juice, and the like, any non-perishable food item will be welcome. Thursday, September 18 at 7PM BookPeople Presents Bestselling Authors Ilona Andrews & Jeaniene Frost speaking & signing We are very excited to present bestselling authors Ilona Andrews & Jeaniene Frost together this evening! Filled with romance, the paranormal, and memorable characters, Ilona Andrews brings us a new installment from the Kate Daniels series. href="/author/frostjeaniene">Jeaniene Frost introduces us to her new Broken Destiny series. Don't miss out on this great event! Ilona Andrews is the pseudonym for a husband-and-wife writing team. Together, they are the coauthors of the #1 New York Times bestselling Kate Daniels urban-fantasy series, including Magic Rises, Magic Slays, and Magic Bleeds and the romantic urban-fantasy novels of the Edge, including Steel's Edge, Fate's Edge, and Bayou Moon. They currently reside in Texas with their two children and numerous pets. Jeaniene Frost is the New York Times, USA Today, and international bestselling author of the Night Huntress series and the Night Huntress World novels. To date, foreign rights for her novels have sold to nineteen different countries. Jeaniene lives in North Carolina with her husband Matthew, who long ago accepted that she rarely cooks and always sleeps in on the weekends. Aside from writing, Jeaniene enjoys reading, poetry, watching movies with her husband, exploring old cemeteries, spelunking and traveling--by car. Airplanes, children, and cookbooks frighten her. About Magic Breaks: As the mate of the Beast Lord, Curran, former mercenary Kate Daniels has more responsibilities than it seems possible to juggle. Not only is she still struggling to keep her investigative business afloat, she must now deal with the affairs of the pack, including preparing her people for attack from Roland, a cruel ancient being with god-like powers. Since Kate’s connection to Roland has come out into the open, no one is safe—especially those closest to Kate. About The Beautiful Ashes: In a world of shadows, anything is possible. Except escaping your fate. Thank you for supporting Ilona Andrews, Jeaniene Frost, & your local independent bookstore! Ilona Andrews will sign and discuss the newest Kate Daniels novel, Magic Breaks (Ace; $25.95). Ilona Andrews is the pen name for the husband and wife team Ilona and Andrew Gordon. They have co-authored two series, the best-selling Kate Daniels urban fantasies, and romantic urban fantasy, The Edge. Magic Rises is the sixth book in the Kate Daniels series. Mercenary Kate Daniels and her mate, Curran, the Beast Lord, are struggling to save the Pack’s shape-shifting children, many of whom fail to survive to adulthood. The medicine that can help comes with a huge price. Come and meet this intriguing couple, and learn some of the secrets of great paranormal urban fantasy. Join us for live Google Hangout chat on July 25th at 6pm ET! No matter where you are, you can sign up and watch as we chat about our new book, Magic Rises. There will be time for your questions at the end, and you can even order a personalized, signed book! It's like a live book signing except you don't have to leave home to join! Details about this Booktalk Nation event can be found at booktalknation.com/author/andrews - Signing up is required, but this event is free. Ilona Andrews is the pseudonym for a husband-and-wife writing team. Together, Andrew and Ilona are the co-authors of the New York Times bestselling Kate Daniels urban fantasy series and the romantic urban fantasy novels of The Edge. Thank you for supporting Ilona Andrews and your local independent bookstore! Ilona Andrews will sign and discuss Gunmetal Magic (Ace; $7.99). Chloe Neill will sign and discuss Biting Cold (Nal; $15.00). Chloe Neill is the New York Times and USA Today bestselling author of the Chicagoland Vampires and Dark Elite series. The New York Times bestselling Kate Daniels novels have been hailed as “top-notch urban fantasy” (Monsters and Critics). Now, Ilona Andrews delves deeper into Kate’s world, and reveals its untold stories… After being kicked out of the Order of the Knights of Merciful Aid, Andrea’s whole existence is in shambles. She tries to put herself back together by working for Cutting Edge, a small investigative firm owned by her best friend. When several shapeshifters working for Raphael Medrano—the male alpha of the Clan Bouda, and Andrea’s former lover—die unexpectedly at a dig site, Andrea is assigned to investigate. Now she must work with Raphael as her search for the killer leads into the secret underbelly of supernatural Atlanta. And dealing with her feelings for him might have to take a back seat to saving the world…Ilona Andrews is the pseudonym for a husband-and-wife writing team. Together, Gordon and Ilona Andrews are the co-authors of the New York Times bestselling Kate Daniels urban fantasy series and the romantic urban fantasy novels of The Edge. They currently reside in Texas with their two children and numerous pets. In order to have anything signed at this event, a copy of the event book must be purchased from BookPeople. If you purchase your book from BookPeople in advance of the event, please save your receipt and present it at the event. Thank you for supporting Ilona and Gordon Andrews and your local independent bookstore! Ilona Andrews is the penname for a husband-and-wife writing team. Ilona is a native-born Russian and Gordon is a former communications sergeant in the U.S. Army. They met in college, and currently reside in Oregon with their two children, three dogs and a cat. They have co-authored two series, the bestselling urban fantasy of Kate Daniels and romantic urban fantasy of The Edge. Ilona Andrews's book Hex Appeal was available from LibraryThing Early Reviewers. Ilona Andrews's book Dark and Stormy Knights was available from LibraryThing Early Reviewers. Ilona Andrews is currently considered a "single author." If one or more works are by a distinct, homonymous authors, go ahead and split the author. Ilona Andrews is composed of 4 names. You can examine and separate out names.